To replace manually read thermometers with 3-wire, 100 ohm, platinum RTDs allowing all temperature readings to be taken in a central control room. Also, to provide automatic temperature control for more efficient control of the refining process. Historically, sugar refineries are reluctant to spend money on capital equipment. As a result, they tend to be slow in automating their process. Many still utilize manual thermometers that require some-one to “make the rounds” to read the temperatures and make manual adjustments to the steam valves. This process is cumbersome and slow, particularly when trying to maintain constant temperature at multiple sites. Those refineries who have made the plunge have found that automation of the process has among other things, greatly improved the efficiency of the process. 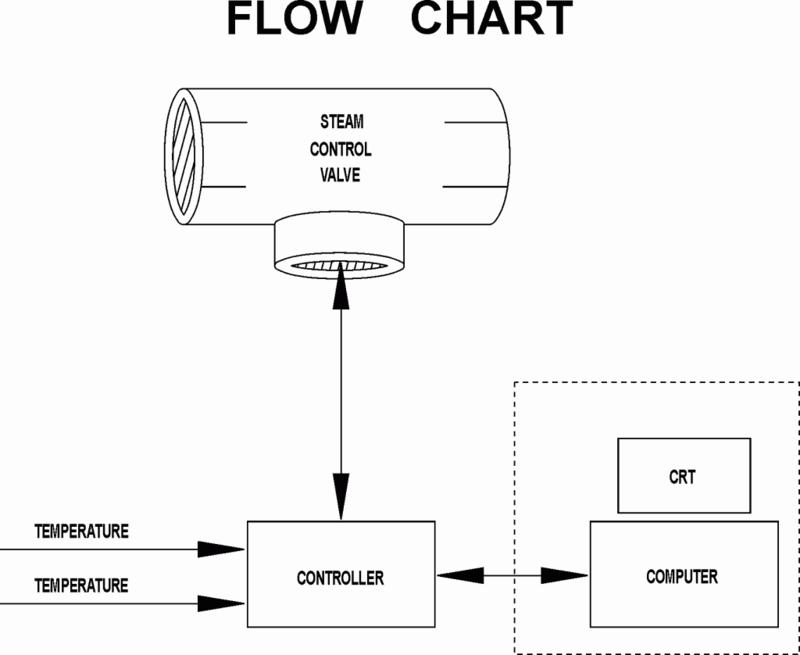 In this particular application, shown in the flow chart, the customer must read and maintain temperatures at multiple locations including in/out temperatures of heat exchangers as well as the top/bottom temperatures in the pan. The pan temperatures must be exactly right in order to “seed” them to make crystal. The customer chose to automate the plant with Moore 352E programmable loop controllers to control each temperature control loop, Fisher Controls steam valves and a central computer to poll each controller for CRT readout and data gathering in the control room. Each Moore 352E can handle up to 5 analog inputs and 3 analog outputs. In addition, the 352E has a resident 24 V power supply capable of powering up to at least 3 current loops. However, in order to read an RTD directly, the 352E must be equipped with an optional RTD input at a cost of about $300 each. By using a low cost 2-wire transmitter, the customer can save ap-proximately $200 per RTD input. The product chosen was the TW303 RTD input 2-wire transmitter. Its small size, low cost, reliability, and versatility in mounting (field or panel mount in a variety of industrial housings and enclosures) made it the ideal choice. 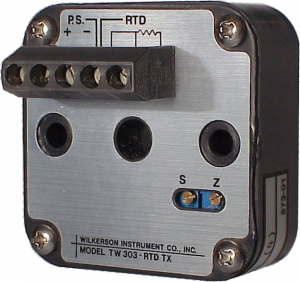 The transmitter accepts any 2-wire or 3-wire RTD input and has a minimum span of 50°F. It can be calibrated to cover any range desired within the limits of the RTD selected. The module operates over a temperature range from -13°F to 176°F while providing a temperature stability of ±0.02% of span. It will also operate over a supply voltage range of 12 to 48 VDC. 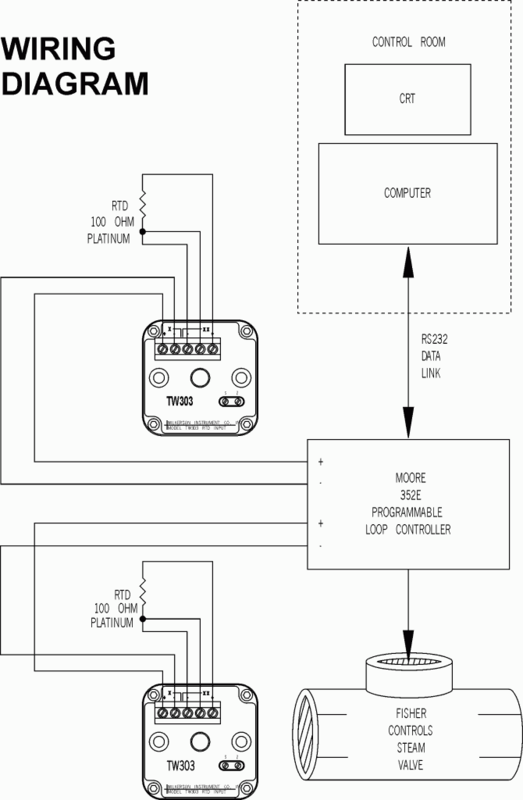 The transmitter design provides accurate trouble-free operation. A single constant current source excites the RTD, but the low excitation current causes no appreciable self-heating in the RTD. An accurate and stable leadwire compensation circuit uses the third lead of the 3-wire RTD to compensate for the RTD lead resistance. Platinum RTD inputs are linearized and use of low-drift chopper-stabilized amplifiers and special filtering reduces susceptibility to transients and noisy operations. In addition, the electronic board and components are conformal coated to resist corrosion, moisture and fungus associated with harsh industrial environments. These features, a generous 5 year warranty, customer service second to none in the industry, low cost and a recommendation from the Wilkerson representative, led the customer to choose the TW303. The customer connected them as shown in the wiring diagram. Approximately $200 per RTD input.